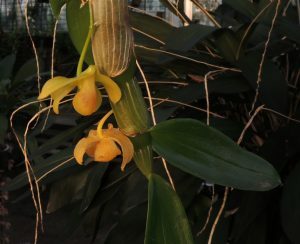 This is a new Dendrobium for 365 days and is a species native to South East Asia with an unusual slipper shaped lip. The species grows at 1400m and usually as a lithophyte on limestone rocks. It produces flowers in ones and twos from older pseudobulbs. The plant has a spreading habit with regular keikis and we hope it will present a good display when more mature. The bulbs are attractive as they are very flat in cross section. What does “With regular keikis” mean please.